What champions are most popular in current meta and why? When you should push lane and roam? What items to build? Masteries and runes for mid lane champions. Warding at Midlane. Mid lane is one of the lanes that’s very popular among the players. Everyone knows that from the middle lane you can roam to anywhere on the map and help your team to win the game, but the lane is so popular that most people don’t even know why they want to play it. If you are not sure about what champs you should play then maybe our LoL coaches can help you with that. This article will cover what the mid laner must do to improve his position in ranked solo queue, what champions are the best in the meta right now, how to play them, etc. Since the mid lane is relatively close to everything in the game, some of the mid lane champions can roam from as early as level 6. This is a very important fact because making plays around the map contributes to increasing your team’s advantage and maybe will be enough to carry you and your team mates through the early and mid game by making your enemies have to play more reactively and thus not be able to make any plays happen. To be able to roam safely, however, you have to use wards so that you know where your enemies are. If you are playing an assassin, wards can be also used offensively as you see your opponents and can take a shot at their well being while knowing that they have no immediate back up from their mates. WHEN YOU SHOULD PUSH A LANE AS MID LANER? Knowing when to push or when to let your minions be pushed is also important to mid laners. Pushing means that your enemy cannot help their jungler without losing minions when your jungler, top laner or bottom lane duo invades the enemy jungle to ward, get a buff or kill some enemies while you can go without losing anything. Another use for a pushed wave is when your jungler gives you a buff. By pushing the wave you won’t lose minions while killing the buff-wielding neutral monster. Pushing also allows you to put up wards, possibly where enemies don’t know since the opponent won’t be able to keep vision on you for the whole time that you are missing. WHEN YOU SHOULD LET ENEMY PUSH A LANE AS MID LANER? Letting the enemy push the wave is important when you are behind so that you can receive help from your team, but be careful when you let the enemy push you in because they might want to dive you with the help of their team. In case the enemy leaves the lane after pushing the wave you should tell your team mates that they are missing so that they know what to expect. This is possible only if the enemy’s health is bigger than 75% since no one would pull off a gank with less health than that because of the possibility that they get counter ganked by the opposing jungler and they end up dying. Even if you are being constantly pushed in, you should still ward, but not in the same positions. 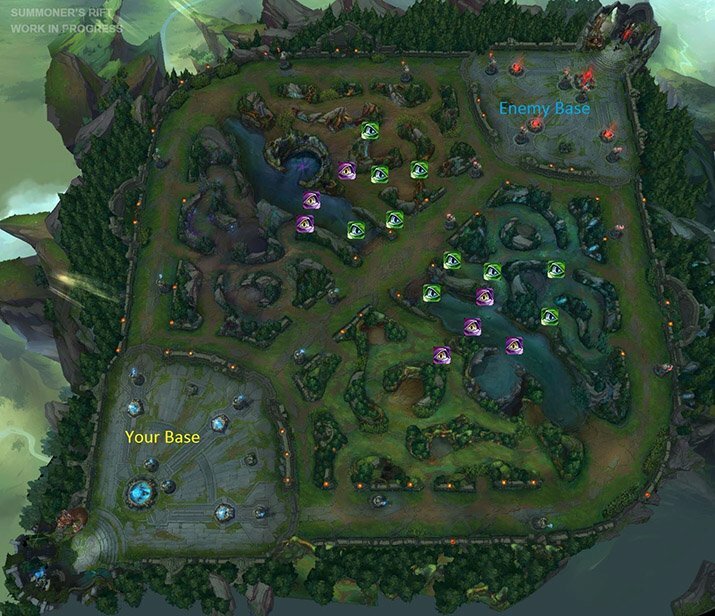 When you are pushing the wave you should place offensive wards, in the enemy jungle, while when you are pushed you should place defensive wards in your own jungle. Neutral wards, the ones on river, are also important. Usually, those will be pink wards and in the bush between the mid lane and the dragon. HOW TO ROAM AS MID LANER? When you roam you should be careful of your positioning because it differs in each scenario. If you group with your team to contest an objective than you should assume a defensive position if you are a mage, while if you are playing an assassin you should try to either flank your enemies, which can be very dangerous early in the game if you do not have the necessary wards, or you can be close to the frontline, enough to be able to engage the fight at the right time, but not enough for your enemies to be able to initiate the fight by landing crowd control on your champion. If you are roaming for a kill, then you should be in an offensive position at all times since you are the factor that decides the fight and you have to make your presence felt immediately for the gank to be successful. Generally, everything that you do on the mid lane has consequences, so you have to be careful at all times and try to make the right choices. Usually, the mid lane champions are either mages or assassins, but there can also be marksmen such as Ezreal and Varus. At the moment, the meta revolves around poke and strong crowd control, this shows very much in the mid lane champion pool, the most played champions being Ahri, Viktor, Twisted Fate and Orianna. Even though all of them have a potential for burst, only one of them is an assassin. All of them have things that make them great all around. Ahri, as the assassin, has great mobility and good, frequent burst damage, single target crowd control and decent wave clear, while the mages all have great wave clear, decent burst ( the damage is good, but the number of times they can use it in a game is certainly lower than what an assassin can pull off), area of effect crowd control that’s on a rather short cool down and they have the ability to turn a fight depending on how they use their kits. Even if these are the most popular champions in the meta, this doesn’t mean that in solo queue people won’t pick something to counter your pick, so you have to be careful and think about all the possibilities before picking your champion. Playing against a champion that counters your pick is often very hard because you will have to play more defensively so that you don’t die and give them a lot of advantage. Usually, champions with a lot of crowd control can beat Ahri even with her good mobility, but these aren’t the only ones that can achieve this feat. Champions with fast burst such as Talon are also good against her because she might not be fast enough or it might not be enough to stop the assassin. Ahri is great versus champions with poor early game such as Azir, Viktor, Orianna and Cassiopeia because once she charms them, they will get chunked for at least half health and they’ll have to play defensively until they get their health back so that they cannot be killed without having to spend a lot of resources on them. Viktor is used very much because of the fact that he doesn’t have very many matchups where he straight up loses because of the versatility of his kit. Melee assassins whose damage ramps up over time susch as Zed cannot kill him because of Gravity Field’s stun and Siphon Power’s shield, while poke champions sometimes get out-traded by the immense damage on Death Ray. Keep in mind that if you upgrade Death Ray by purchasing a Hex Core upgrade, it will deal double damage, not instantly, but it is still a lot of damage. The matchups that Viktor loses are against ranged, mobile assassins such as Ahri and poke champions with a very long range such as Kog’Maw. Even if he beats some melee assassins, this doesn’t mean he beats all of them, having a very hard time against Talon and Diana. Viktor is great versus champions with an early game that’s poorer than his such as Azir, but he is also capable of beating Cassiopeia by outranging her, the same can be said about his matchup against Orianna. When against Twisted Fate, the difference between them isn’t felt early game because both of them have a very long range, so they can avoid skirmishes, but during team fights Viktor destroys Twisted Fate because if he focuses all his damage on a single target he can deal as much or even more than an assassin. Twisted Fate has a very hard time laning against assassins because of the fact that he’s very squishy. He has to avoid fights at all costs because he loses all of them unless the enemy misses their skills. Besides assassins there aren’t any champions that can beat Twisted Fate in the laning phase because of his enormous range that allows him to farm safely until laning phase is over. He does well against champions who farm very ineffectively under tower such as Azir and against champions whose range is lower than his such as Orianna and Cassiopeia. During the laning phase it’s the perfect time for Twisted Fate to use Destiny to help out his team mates or extend the lead they have. Orianna is a champion that’s always been played in solo queue and competitively because she’s the jack of all trades being able to do everything she has to do to win the game. The matchups she’s countered in are against assassins, champions with long range and mobile champions in general. If her enemies are mobile then she isn’t able to use her ultimate reliably since they might dodge it and so she loses a big part of her damage. Orianna is winning matchups where her enemies are having a range lower than her and aren’t mobile. By having a lower range than she does, they are going to get poked the whole time they are trying to farm and thus she’ll have the health advantage while also being able to zone her enemy, thus achieving an experience lead as well as gold lead. Now that you know what champions to pick and how their matchups go, it’s time to talk about what they can do after the laning phase is over. The mid game and late game are the moments where most mid lane champions shine because all of them have great scaling and are very useful to their teams. Ahri is a champion that thrives on the moment an enemy champion is careless so that she can assassinate them and continue split pushing or forcing a team fight where the enemy team is at disadvantage. The best position Ahri can be in is a flanking position because this way she’ll be able to land her spells on priority targets without being interrupted by enemies. Viktor and Orianna are both champions that do best during team fights because of their area of effect abilities and utility that they bring on the table. Viktor’s Death Ray and Chaos Storm as well as Orianna’s Command: Dissonance and Command: Shockwave should be used to hit as many enemies as possible while Viktor’s Siphon Power is used to deal a lot of damage to a single, important target and Orianna’s Command: Attack is used to position the ball while also dealing damage. Gravity Field, Command: Dissonance, Command: Shockwave and Command: Protect bring in a lot of utility. The upgraded Gravity Field works almost as Command: Shockwave does because it pulls in enemies. Orianna’s abilities give movement speed, slow, knock back and a shield that gets rather big with a lot of Ability Power. Twisted Fate is best used as a second split pusher while the jungler, marksman and support push the middle lane. Having two split pushers against a team that has only one is great because if they send someone to deal with the minion wave that you push to the turret, they will be at a disadvantage on another lane so your team will take advantage of that and take objectives such as towers, vision or neutral monsters. When team fights happen you have to make sure that your Destiny is used well since if you position it wrong you will die instantly and will not do anything good for your team during that fight. If Destiny is well positioned then you will be able to dish out a lot of damage and crowd control. It’s better to use red card when there’s no enemy chasing you so that you can damage more enemies at once and also slow them, but if a priority target is near you or if you are being chased by an enemy assassin or fighter then you should use gold card to stop them while dealing a considerable amount of damage. During the late game Twisted Fate has enough damage to burst marksmen with no magic resistance, but that depends on if Stacked Deck is charged and ready to land because it deals a lot of damage, 155 + 0.5*AP which in combination with Pick a Card’s gold card deals 45 + AD + 0.5*AP. This is around 300 damage without any Ability Power. In combination with Lich Bane and the rest of Ability Power that you have, it can easily deal over 1000 damage. These champions use similar runes and masteries because they are all using Ability Power and all of them deal magical damage, but some have differences that help them do well. The differences are only visible because of the runes they use, because the masteries are pretty much the same for all of them. They all use 21/0/9 masteries taking Sorcery, Butcher, Feast, Mental Force, Arcane Mastery, Executioner, Archmage, Dangerous Game, Devastating Strikes and Havoc in the Offense tree and Phasewalker, Expanded Mind, Summoner’s Insight, Alchemist and Culinary Master in the Utility tree. Ahri, Orianna and Viktor use Greater Marks of Magic Penetration, Greater Seals of Scaling Health, Greater Glyphs of Scaling Cooldown reduction and Greater Quintessences of Ability Power. These runes help them be durable while increasing their instant damage and decreasing the cool down of their spells. Having decreased spell cool downs help them chunk their enemies more frequently or even burst them. Dealing damage isn’t the only thing that cool down reduction runes help since they also allow them to use their utility abilities more frequently. Using those abilities as frequently as possible is very good for them and their teams because these abilities can turn fights in the allied team’s advantage. Twisted Fate has two possible rune pages that he can choose from depending on what play style the player adopts that game. If the player sits on lane more, they can choose the same runes that Ahri, Orianna and Viktor use, else they can swap the Glyphs to Greater Glyphs of Scaling Ability Power and the Quintessences to Greater Quintessences of Movement Speed. These runes will allow Twisted Fate to roam better since the extra movement speed will get him in range of using Destiny to get to the perfect spot. Let’s discuss item builds for most popular mid lane champions in current meta which you should use to boost your ranked position. Ahri is a champion that tends to build as much damage as possible, often going for Luden’s Echo or Abyssal Scepter as first items because of the extra damage they provide, but if the lane isn’t going too well she can opt for Morellonomicon or Athene’s Unholy Grail as first item. The optimal build for Ahri is Luden’s Echo, Sorcerer Shoes, Rabadon’s Deathcap, Void Staff, Zhonya’s Hourglass and Rylai’s Crystal Scepter because these items provide the most Ability Power possible, thus letting Ahri reach the most damage she can deal. Something very important for Ahri is switching the Warding Totem to a Sweeping Lens as soon as possible because there’s no point waiting to assassinate someone if they aleady see you. Viktor is a champion who can skip the mana regen item if the player wants more damage because of the mana bonus from Hex Core. Viktor is rather strong because he can build any item made from Needlessly Large Rod as the first item if he needs to. Luden’s Echo is good for when you win lane, Rabaddon for an equal lane, Zhonya when against an assassin and Rylai when against a champion whose damage can be avoided. If the damage cannot be avoided and you are against a magical damage based champion then Abyssal Scepter is good even if it’s not made from Needlessly Large Rod. The best build damage wise for Viktor is Perfect Hex Core, Luden’s Echo, Sorcerer Shoes, Rabadon’s Deathcap, Void Staff and Lich Bane, Rylai’s Crystal Scepter or Zhonya’s Hourglass, depending on how the game is going. Lich Bane is the item that increases your damage the most because of the unique passive that works great with Siphon Power. Orianna has to build a mana regeneration item as the first one because she has no innate regeneration and the low cooldowns she has allows her to use spells very frequently, thus losing mana all the time. Right after the mana regen item she has to build Rabadon’s Deathcap or Luden’s Echo to increase her damage. A good item build for her is Morellonomicon, Sorcerer Shoes, Rabadon’s Deathcap, Void Staff, Zhonya’s Hourglass and Rylai’s Crystal Scepter or Luden’s Echo, depending on if she needs more defensive statistics or not. Twisted Fate loves having a lot of movement speed to work with when trying to gank or when moving around the map from the lane he is split pushing to his team. 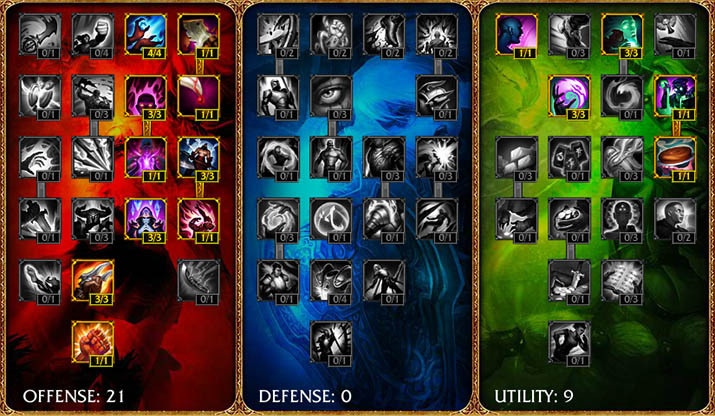 Because of this, Lich Bane and Luden’s Echo are the core of his build. You can buy only one of them or you can buy both if you need more damage later in the game, both choices are good. Ionian Boots of Lucidity are the correct Boots of Speed upgrade for Twisted Fate as he uses cool down reduction very well in clearing waves and reducing the cool down of Destiny so that he’s able to return to split pushing as early as possible. A good build for Twisted Fate is Lich Bane, Ionian Boots of Lucidity, Rabadon’s Deathcap, Void Staff, Zhonya’s Hourglass and Luden’s Echo. In case you need more defensive items you can swap Luden’s Echo for Rylai’s Crystal Scepter or Abyssal Scepter. As Twisted Fate it’s important to use Greater Stealth Totem as trinket because you need to have vision of your enemies since they’ll be able to kill you pretty easily if you get caught out of position and this will put your team at disadvantage while the enemy team will be able to capitalize on your mistake and take objectives or start a fight which they will win because a big part of your team’s damage is down and will not be able to join the fight. Where is Xerath and many more mid laners? An excellent general guide about behavior on the middle lane. It’s a pity that the general behavior of champions is provided by only a few examples, such as Ahri, Viktor, Twisted Fate and Orianna. I would like to know what the author thinks about other champions, such as Lux or Katarina. Old but good overview of mid lane strategy which doesn’t change much over the years. However, would be nice if you will write a new guide for the current time and meta.